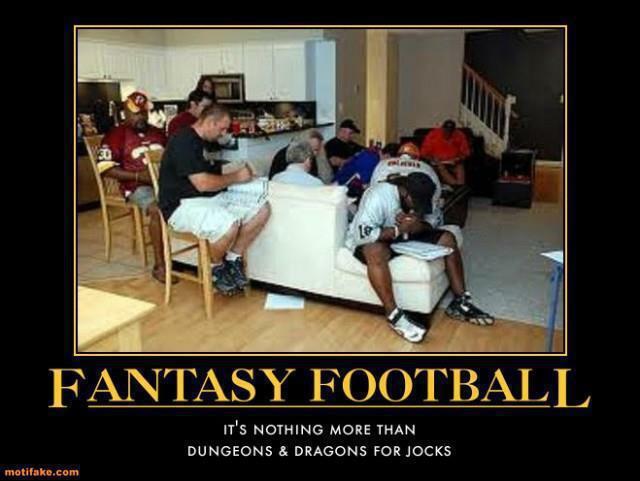 I – along with an estimated 33 million people – play fantasy football. Like many, I am terrible at it. Other than a third place showing the first year I did it in grad school, I’ve always finished in the middle of the pack or lower. I hand over my money every year, diligently study the draft guides, become convinced that my team will win, and then watch as I’m in last place after week one, with all my best players injured. This year was no different. I drafted what I thought was an excellent team, had a 30 point lead going into the last game, and watched as Calvin Johnson destroyed me. But no one cares about anyone else’s fantasy teams. And that’s not what this article is about. Instead, this article is about what fantasy football can teach. There are many lessons outside of never draft a kicker in a single-digit round, or you can never have enough running backs. So, let’s look at the typical fantasy football season, and how each aspect applies to life. Preparation. Fantasy football seasons are won and lost before the draft even begins. There are a host of draft guides to read, expert opinions on who the best players are at each position, and strategies on who to draft when. Whether you’re picking first or last, snake draft or auction, there is knowledge you need before the draft begins. The more you know, the better you can react to the different scenarios that will occur in the draft. If you were eyeing a certain player, and he’s been taken by the guy before you, proper preparation allows you to not sweat it and select another player. If you didn’t prepare…you end up drafting a mid-level quarterback in round one. Ouch. In life, preparation is also key to success. Paraphrasing the British Army, proper preparation prevents piss-poor performance. Whether in business or an athletic pursuit, the more you prepare, the better you perform. When I’ve been training properly for a race, I run faster. When I’ve gone over a presentation several times, I feel more confident when I give it. Without preparation, success can be difficult to find. Execute the plan. So you’ve prepared your draft list and have thought of several different scenarios. Maybe you’ve even done some mock drafts to practice drafting quickly and efficiently. Once the real draft begins, it’s time to put that plan into action. Using your preparation as a base, you easily draft an all-pro team of players sure to bring you a championship (and that sweet, sweet cash). If your plan called for you to draft Frank Gore, but he was off the board when your turn came up, you didn’t sweat it because you had a plan. You just went to the next best player on your list and drafted them instead. At the end, you were happy with your team because you followed your plan. Preparation goes for nothing if you don’t execute on that plan. During training, you may have practiced when to fuel up and drink water. Yet if you don’t follow that plan during the race, you will blow up and struggle to finish. You may have gone over your presentation several times and even given it before to coworkers. But if you don’t follow what you practiced, you will stumble in front of your peers. Execution is critical, whether it’s sports or business or life. Failing to execute is just wasting your preparation. Roll with the punches. Of course, things rarely go according to plan in a draft, or during the fantasy season. I weep for everyone who’s lost a quarterback or star running back in the first week (it happens!). When your players are knocked out, you need to adapt and figure out a new plan to achieve victory. Start scouring the waiver wire or consider a trade with another team. Maybe you lost your QB but you have too many good running backs, while another guy needs some help in the running game and has three awesome QBs. A trade can be mutually beneficial. The point is, you don’t give up when the plan falls apart. Being adaptable is critical to success as well. I’m going to break the news to you: life will NOT go according to your plan. You have a choice: curl up and cry, or adapt and make a new plan. You need to just roll with what life gives you and make the best choice you can. When a race isn’t going well and I’m not following my plan, I need to adapt to the situation and make the best of it. During the Bardof 5k this past August, I had planned to set a PR. But I ran 14 miles the day before, and it was crazy hot and humid. After a mile, I knew I wasn’t going to meet my goal so I adapted to the situation and made a new plan: survive. Adaptability allowed me to finish and not die, so I consider that a win. Luck. Luck is a vastly underrated component of fantasy. Depending on what side you look at, THIS is either incredibly good luck that caused a win, or terrible luck that led to a loss. A last second kneel down or a garbage time touchdown can be the difference between winning and losing. Don’t under estimate luck! Luck also helps explain success elsewhere. My coworker got a big project that was fully prioritized and assured of moving forward. Why her and not me? Because I had gone to lunch early and was unable to request it. It was her good luck that I wasn’t there to get the project, and it was my terrible luck to not be there. There you have it. We can learn a lot about how to be successful in business or life by paying attention to the lessons found in fantasy football. Don’t knock it!